← UNPRECEDENTED: This is a stone-cold Neocon warmonger talking about John Bolton! Hawks are closing in on the White House. John Bolton, arguably the most abrasive American diplomat of the twenty-first century, will soon assume the top foreign-policy job at the National Security Council. As is his wont, President Trump announced yet another shakeup of his inner circle in a tweet late on Thursday. He dismissed General H. R. McMaster, who couldn’t survive a testy relationship with the impatient President despite his battle-hardened career and three stars on his epaulets. Trump tapped Bolton to take over. A former U.N. Ambassador currently best known as a Fox News pundit, Bolton has advocated far harder positions than Trump, including bombing campaigns, wars, and regime change. The late-day news flash sent chills across Washington, even among some Republicans. 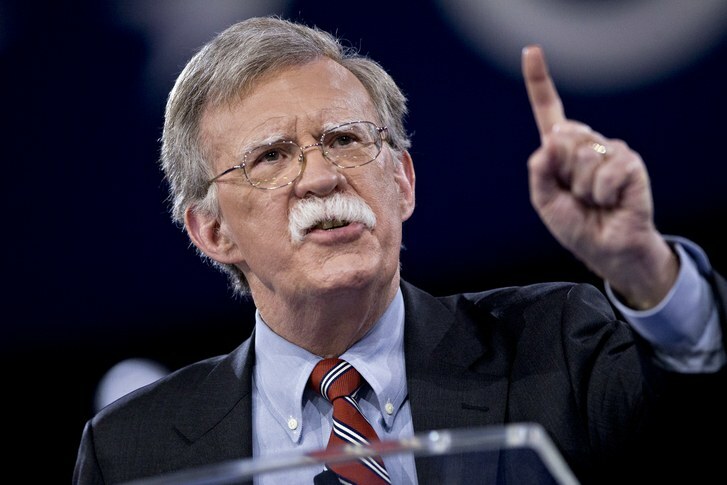 Shortly before the Iran deal—brokered by the world’s six major powers—Bolton wrote a piece in the Times entitled “To Stop Iran’s Bomb, Bomb Iran.” In it, he predicted, “Iran will not negotiate away its nuclear program. Nor will sanctions block its building a broad and deep weapons infrastructure. The inconvenient truth is that only military action like Israel’s 1981 attack on Saddam Hussein’s Osirak reactor in Iraq or its 2007 destruction of a Syrian reactor, designed and built by North Korea, can accomplish what is required. Time is terribly short, but a strike can still succeed.” Three months later, Iran accepted the nuclear deal, the most significant nonproliferation treaty in more than a quarter century. The deal was endorsed unanimously in a U.N. resolution. Trump has vowed that he will withdraw from the deal without fixes by mid-May, a move that Bolton clearly supports. Bolton has also long backed a cultlike Iranian opposition group, the Mujahideen-e Khalq, or M.E.K., which has been held responsible for the murder of multiple American military personnel, the attempted kidnapping of a U.S. Ambassador, and other violent attacks in Iran before the 1979 revolution. The M.E.K. was based in Iraq during the regime of Saddam Hussein, who provided arms, financial assistance, and political support. In 1997, it was among the first groups cited on the U.S. list of foreign terrorist organizations. It wasn’t removed until 2012. Bolton spoke at an M.E.K. rally last year—for the eighth time—in Paris. Other speakers at M.E.K. rallies have reportedly been paid tens of thousands of dollars for their appearances. The answer to China’s fear of an uncontrolled collapse, Bolton wrote, “is a jointly managed effort to dismantle North Korea’s government, effectively allowing the swift takeover of the North by the South.” Not even the South Korean President, Moon Jae-in, supports that idea; he has been trying to broker a rapprochement with the North. The deepest disagreement between Bolton and Trump may be over Russia—especially its President, Vladimir Putin. In an op-ed last July, Bolton wrote that undermining the U.S. Constitution “is far more than just a quotidian covert operation. It is in fact a casus belli, a true act of war, and one Washington will never tolerate.” He charged that Trump had been duped by Putin in their meeting on the sidelines of the G-20 summit last summer. Bolton has worked for three Republican Presidents—Reagan and both Bushes. He gained his reputation as a feisty hawk after George W. Bush appointed him to be Under-Secretary of State for Arms Control and International Security. By 2005, he was so controversial that his nomination to be U.N. Ambassador failed to win Senate approval, and Bush appointed him as a “recess appointment” when Congress was not in session.